Accessories, or how to systematize and store your belongings. Any closet is meant for storing your belongings. But how to store them is not an easy question to answer. It doesn’t take much to fill the closet in with various things. 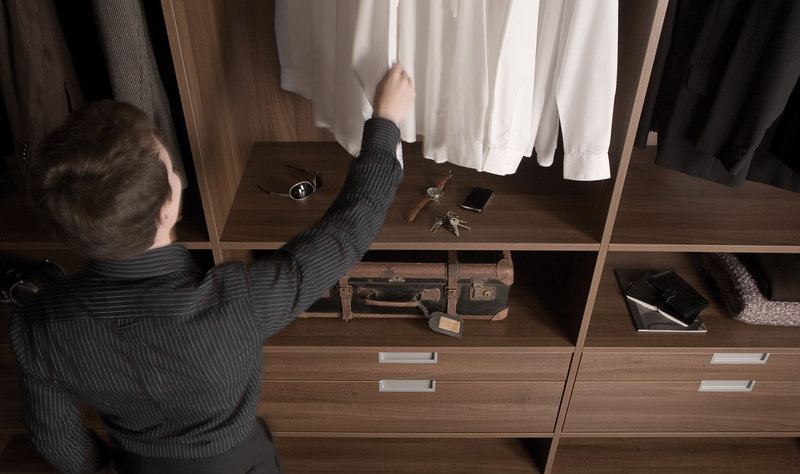 It is much more difficult to create an inner system of storing clothes and accessories. And this is where professionals step in. However, you should already have some useful info before turning to professionals. So, even if at first you do not have many things and clothes, which need systematized storing, you will definitely discover this necessity with time. Life goes on – your wardrobe grows. And the moment when there is not enough space in your closet is unavoidable. 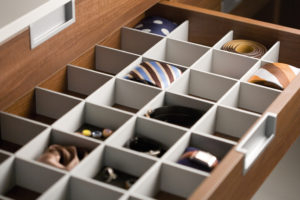 Moreover, you get to realize the problem of storing smaller things – footwear, bags, belts, ties, scarves. And all of this because you did not think it through when ordering the closet. 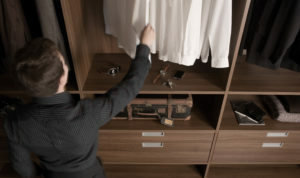 Therefore, when you turn to professionals for a consultation you should to realize that a closet or a wardrobe is not designed for a day, month or a year, and this furniture should meet our needs during many years ahead. So, the first thing to consider is your hobby. Many people have interests, and these interests require buying certain things. Hobbies like these include fishing, winter and summer sports, and so on. Most people buy special inventory for their leisure activities, clothes, and accessories. Naturally, all of that requires storage space. Therefore the designer of your furniture should be aware of your needs, even if right now you have no plans of storing fishing rods, golf clubs, skis or sports outfit. The same thing can be recommended to active travelers. According to our experience, spacious bags and suitcases often find their places in closets for clothes or in wardrobes. A designer will help you anticipate a place for storing these large things. 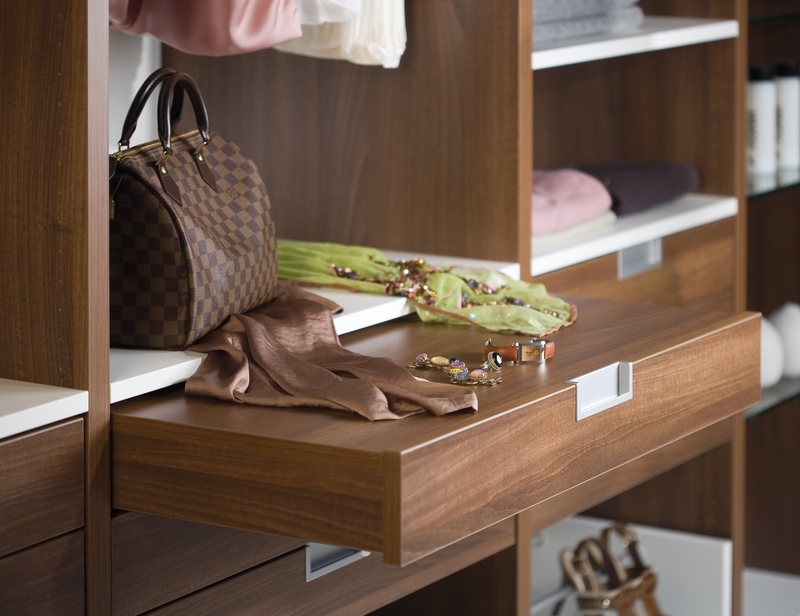 The second thing, often overlooked while designing a closet, is the space for storing small objects. This aspect needs to be considered separately for men’s and women’s belongings. For example, women usually find it difficult to store bags, which can be many (a clutch for the theater, to visit friends, a casual purse, etc.). That is why a wardrobe can have special sections for storing bags. They can look like vertical bee honeycombs. By the way, similar shelves are good for storing folded things. You can’t help agreeing that not all shirts, blouses or jumpers need to be hung. Men mostly have problems with storing ties and belts. 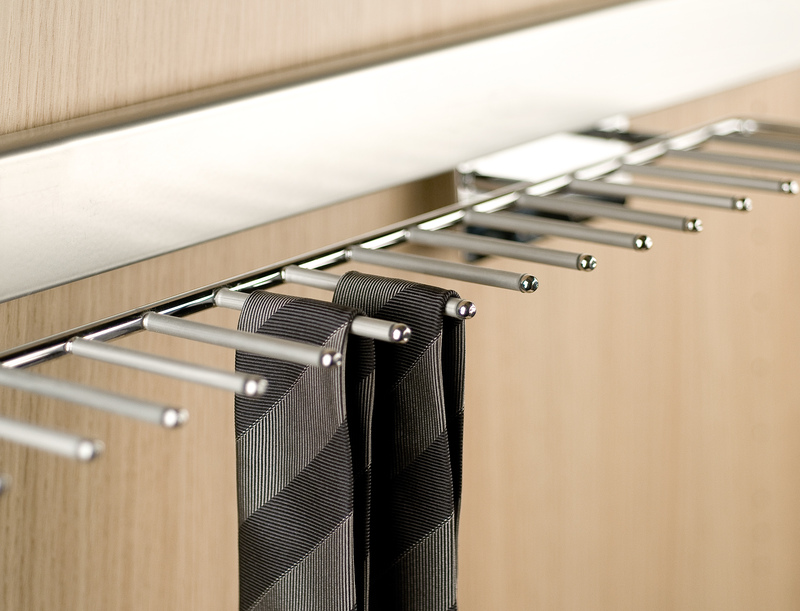 Leaving ties hanging on a hanger, and belts in trousers is not an option; clothes get rumpled, the fabric deteriorates. So, where should they be put? 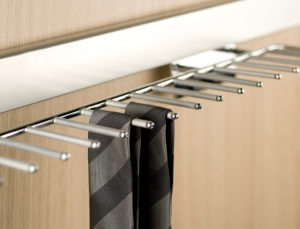 There exists a special kind of shelves, meant for hanging ties. Moreover, there are special small boxes and shelves with separate cells for any small accessories, including ties and belts. They are stored in these honeycomb cells rolled up where they do not rumple. Don’t take this as a joke, but you should also have a place for storing dirty clothes. We all know that some men drop dirty clothes everywhere. So, it would be enough with having a hermetic container in the closet, and the problem is solved. All of this in reality is simply the culture of storing things. In European countries it has been well developed by long history and long-term experience. It would be a pity not to use it. In other words, we should take over the good things, found in the developed countries. One should take into consideration the culture of storing things while planning the closet or wardrobe. Unfortunately not everyone has the right idea about this matter. Every member of the family should have his own space; as designers rightfully admit, the woman’s area in the closet should be more spacious. If the family has a child, there should also be a space for storing the child’s things. However, the question of distributing the space between the members of the family is an individual issue. Designers are irreplaceable facilitators in this question. 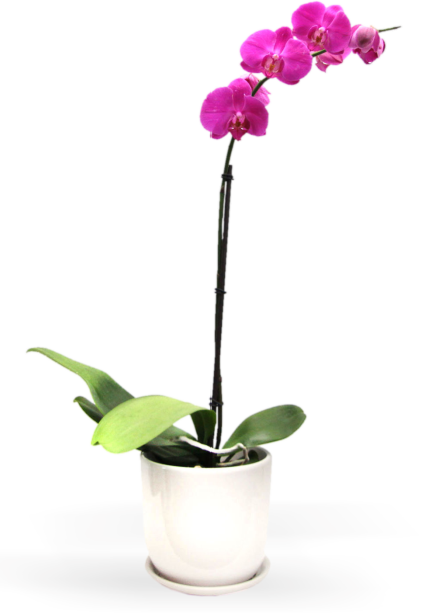 Their task is finding the right solution in terms of good looks, practicality and ergonomics. By the way, as to ergonomics, designers recommend using the principle of zoning, that is having a separate zone for all kinds of clothes, umbrellas, footwear, etc. Please accept the fact that it is impossible to consider all nuances of planning the closet on your own. There are multiple questions. What is the color range of clothes? Do you wash your clothes or use the service of the laundry? Which outer clothes re you going to store for a long time? How active is the style of life of the family? Where the closet will be placed? And many others. And last, but not the least. Well designed furniture is definitely more comfortable, but it doesn’t necessarily mean it is more expensive than the furniture which was not designed beforehand.